Pocket knives are tools, legally not considered to be weapons at all unless over a certain blade length, and even today there are many people who would not be without one. I'm one of those, since I feel very strange without one in my pocket. I carry one at all times. Schrade makes gentlemen's knives, and the Minuteman 2 is dead center in that class. The blades are generally a little too thin for me, but that hasn't prevented me from buying Schrade knives many times over the years. They make a refined knife. It might not be the knife you'd choose as an emergency screwdriver, but if you do that with a good knife, you're a lout anyway and you deserve the bent or broken blade. Modern tempering methods are large scale, not individual as in olden times, so the quality of the knife may vary within acceptable limits. You can buy a knife from Schrade that takes an edge and keeps it, or you can buy the exact same model of that knife and get one that needs more frequent sharpening. 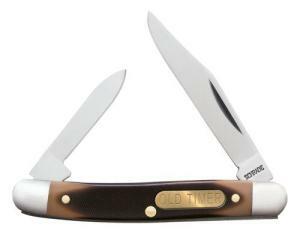 You'll still get a good pocketknife, suitable for most people's needs. If you want something more, you may end up with something too expensive to use.